With respect to Burt Bacharach, Paul McCartney, and the Brodsky Quartet, Elvis Costello’s best collaborations have been with his backing bands, from the Attractions to their more recent incarnation as the Imposters—and now hip-hop workaholics (and Late Night With Jimmy Fallon orchestra) the Roots. Their Wise Up Ghost is a surprisingly successful blend of Costello’s acerbic songwriting with the Roots’ elastic funk. How did this collaboration happen? Who first broached the idea? I suppose Quest did. He said something which wasn’t really a straight­forward: “Hey, let’s do this,” but more just of a suggestion as we were leaving the stage the last time I did Fallon’s show. We didn’t tell any record-company people. I wasn’t actually under contract to anybody, so I had quite a lot of freedom of movement. Wise Up Ghost is packed with melodic and lyrical allusions to your older material. “Tripwire,” for example, is based on “Satellite” from Spike. Were you sampling yourself? I suppose people could look at it as such. You can hear the lyrics from “Bedlam” [from 2004’s The Delivery Man] in the verse of “Wake Me Up.” Gathering all of the images at such a fast pace as we deliver them in “Bedlam” is a challenge to a first-time listener. So I embraced the opportunity to tell that story at a different speed. But clearly I have no problem coming up with new lyrics. And I wasn’t doing it for a magic trick. I hope that people will go beyond simply recognizing where the songs came from. That’s something you’ve always done. Like how “Clean Money” and “Love for Tender,” both from 1980, share a bunch of the same lyrics. Yeah, that’s it. I found a tape of mine in a drawer recently that was recorded in late 1975, maybe early 1976, that’s never ever been issued or bootlegged. It was about sixteen songs, and when I listened, I vaguely remembered them. I was surprised how many lyrics turned up as late as six years later. There’s no special prize for writing a golden first draft. 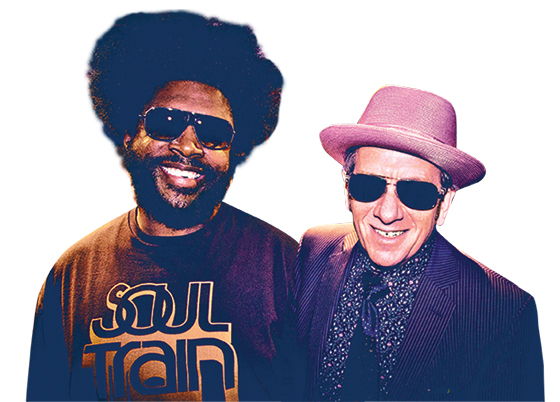 Elvis Costello and the Roots. Blue Note. September 17.